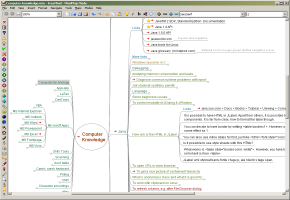 "FreeMind is a free mind mapping application written in Java. FreeMind is licensed under the GNU General Public License. Along with the advantage of unlimited free usage, it provides extensive export capabilities. An XHTML export allows you to create a mapped image with links to a folding outline. What follows are the most notable features of FreeMind. Web and file hyperlinks from nodes...Source"
Commented internet favorites or bookmarks, with colors and fonts having the meaning you want ...Source"
This is an excellent free mind-mapping tool to use both for educators and students!